Mitec was set up in 1989 to design, produce and develop electronic systems for a broad range of electronic engineering sectors. Our commitment to providing a comprehensive service and constantly growing our business led the company to extend its production range in a couple of years with the creation of a series of automated testing systems. Customisation: the true secret of Mitec's success story. With a flexible and versatile configuration, thanks to advanced engineering know-how and a constantly active R&D department, Mitec is able to interpret the needs of its customers by creating ad-hoc products for any application that uses electrical components. The result is a complete service from the product concept to the finished article, capable of serving an exceptionally diverse group of business sectors. 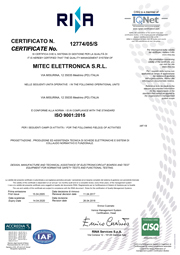 Mitec products are currently employed in industrial, civil and electromedical control systems. These are the core values underpinning Mitec's corporate ethos, and are also the principles that have led to the steady expansion of our company and allowed us to create a highly qualified internal engineering department staffed by skilled and specialised personnel. This organisational structure supports the continual creation of revolutionary new products and technologically advanced solutions in line with a demanding and fast-moving market. Quality as the core value. In line with this key strategy Mitec has operated from the very beginnings with the aim of achieving continual improvements in total product quality. 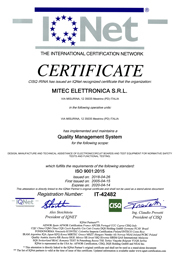 Aimed at complying with the highest standards, the company’s approach has now been rewarded with accreditation to UNI EN ISO 9001, the international quality certification that allows Mitec to offer its customers the maximum possible guarantees. In line with these principles, another jewel in the crown of our quality system is our rapid, responsive and efficient technical support offering fast solutions to any problems encountered by our customers.